Global climatic changes as high temperatures and low precipitation contribute to increase cultivated areas affected by high salt soil content. Soil salinity is well known to reduce the ability of plants to take up water and this quickly causes reduction in their growth rate. V-ATPase (EC 3.6.3.14) and V-PPase (EC 3.6.1.1) hydrolytic and proton transport activities, and gene expression were evaluated in hypocotyls of 3-, 5-, 7-day-old Vigna unguiculata (L.) Walp cv. Vita 3 germinated in 100 mM NaCl in order to highlight their differential regulation and activity modulation under salt stress. Semi-quantitative RT-PCR revealed that both genes were up-regulated by salt stress in all salt exposition times studied. Up-regulation was correlated with the increase in protein content at 5 and 7-day-old seedlings. Co-expression between A and E V-ATPase subunits was also observed. The hydrolytic and proton transport activities showed that these enzymes presented a differential modulation of their activities in the presence of 100 mM NaCl. 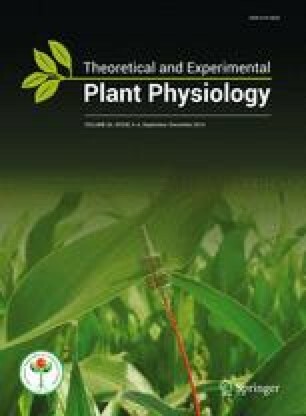 These results suggest that V-ATPase and V-PPase activities are modulated by salt stress and a multi-step regulation is exerted in order to re-establish homeostasis. We thank Dr M. Maeshima for the kind gift of the antibody against V-ATPase subunit A and V-PPase and Dr Y. Kawamura for the kind gift of the antibody against V-ATPase subunit E.